We announced a new name and identity today. Dynamic FX is now known as Magicians.co.uk - we think this name reflects our core business more clearly . While our name, branding and website may have changed, our friendly team and professional performers are all still here, ready to entertain you. 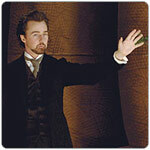 '‘The Illusionist’, a romantic drama also starring Edward Norton, Paul Giamatti and Jessica Biel. In the movie, Norton plays a magician in turn-of-the-century Vienna who falls in love with a woman well above his social standing. When she becomes engaged to a prince, the magician uses his powers to win her back. The script, based on the short story ‘Eisenheim the Illusionist’ by Steven Milhauser was written by Neil Burger who also directed the film. Dynamic FX supplied a team of magic consultants for the film which was shot in Prague. They began work earlier this year, before filming, with elaborate plans to authentically recreate genuine 19th century magic and illusions. 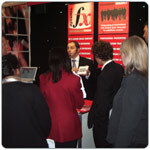 The Exhibiting Show is the UK’s only event dedicated to effective exhibiting. Over 120 companies presented the very best in inspirational exhibition solutions, and of course, we were there! With professional presenters, we generated crowds at our stand and then explained that just hiring exhibition space and hoping for business isn’t enough. You need to grab people’s attention and emotionally engage them while you deliver your message. Actually, Dynamic FX and its parent company Magic Management, have both been at the forefront of magical exhibition and tradeshow presentations for 15 years and in that time have explained hundreds of products, services and company messages to thousands of people. By designing professional presentations integrated with your unique message, Dynamic FX will increase your visibility, generate more qualified leads and make your message more memorable. With excitement surrounding the release of the latest Harry Potter adventure from JK Rowling, we were delighted to discover that Mr Weasley knows the Dynamic FX phone number! 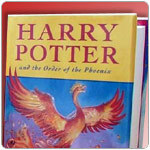 A muggle friend of ours tells us that on page 125 of Harry Potter and the Order of the Phoenix, Mr Weasley dials the Ministry of Magic as he says, “Let’s see..six..two..four..and another four..and another two...” Now that’s MAGIC! When Roman Polanski set out to retell Oliver Twist, he wanted the Dickensian pickpocket scenes to be as authentic as possible. But where do you find a pickpocket who will share his secrets? James Freedman, our pickpocket magician worked closely with Polanski and his team to train Sir Ben Kingsley (Fagin) and Harry Eden (the Artful Dodger) in the age old craft of picking pockets. As the Man of Steal, James is more used to entertaining at corporate events where he steals wallets, watches, credit cards and keys, and incredibly even glasses, belts and ties! But these skills have taken him years to master, so how did he make the actors look like seasoned professionals? “I’d taught actors before for TV shows and had a basic idea of the sequence that I wanted them to learn. We started rehearsals months before filming, but I have to say that all the young actors picked it up quickly and by the end of production, they were ‘borrowing’ things from the crew. I felt a bit like Fagin myself!"